Beautiful certificate from Diner's Club,Inc printed around 1963. This historic document was printed by Security-Banknote Company and has an ornate border around it with a vignette of an allegorical man and woman. This item has the printed signatures of the Company's Chairman and Secretary and is over 50 years old. Diners Club International, originally founded as Diners Club, is a credit card company formed in 1950 by Frank X. McNamara, Ralph Schneider and Casey R. Taylor. When it first emerged, it became the first independent credit card company in the world. While many stores and businesses were in the practice of extending credit to their customers, or allowing them to set up charge accounts, the idea behind Diners Club was that the same card could be used to pay a variety of merchants. In 1950, the first Diners Club cards were given out to 200 associates of McNamara, mostly salesmen who often needed to dine with clients. Diners Club had signed up 14 restaurants in New York City. Membership grew quickly as both new customers applied for the card and more restaurants signed on. By the end of 1950, Diners Club had 20,000 customers and was accepted at over 1000 restaurants. In 1952, McNamara sold his share of the company to Joe Williams of Archer City, Texas, and the company grew unabated for several years, eventually signing merchants all over the United States. Diners Club created what would later be dubbed the Travel & Entertainment (T&E) card market, which focused on cardholders who were frequent travelers and had a substantial income to pay for other high-value charges. As these customers had no need to pay for purchases over time, these cards required that the entire balance of the bill was paid upon receipt. This type of account is known today as a charge card. Diners Club's monopoly was short-lived, however, as American Express and Carte Blanche began to compete with Diners Club in the T&E card market. Diners Club also faced competition from banks who issued revolving credit cards though BankAmericard (later renamed VISA), and Interbank MasterCharge (later renamed MasterCard) towards the end of the 1960s. 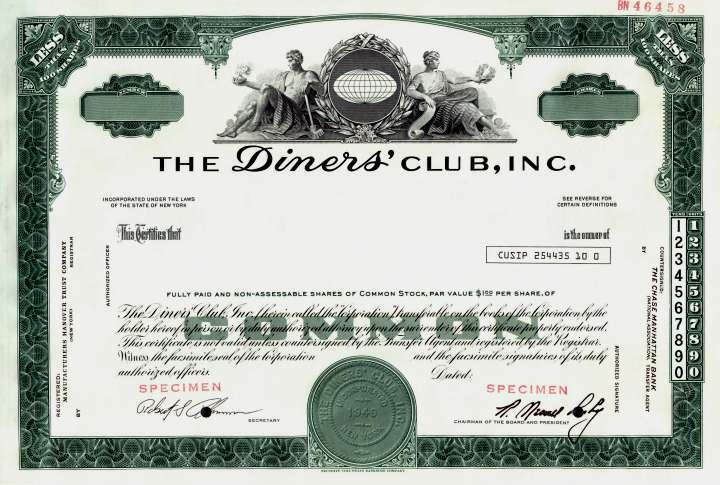 Diners Club began early on to allow franchises of the Diners Club name in first in Europe and later throughout the world, for many years eclipsing the BankAmericard or Interbank MasterCharge networks abroad. Amoco gasoline also issued its own co-branded Diners Club cards for a time. Diners Club North America was acquired in 1981 by Citibank, a unit of Citigroup, though its franchises abroad remain independently owned but operated in part by Diners Club International. In 2004, Diners Club announced an agreement with MasterCard. Diners Club cards issued in the United States and Canada now feature a MasterCard logo and 16-digit account number on the front, and can be used wherever MasterCard is accepted. Cards from other countries continue to bear a 14-digit account number on the front, with the MasterCard logo on the back, and can be used at merchants accepting MasterCard in the United States and Canada. Carte Blanche originated as a Travel & Entertainment (T&E) card owned by Hilton Hotels, and competed with both American Express and Diners Club. The company changed ownership after being sold by Hilton, with Citibank owning the company for a brief period during the 1960s, and finally repurchasing it in 1979, and phasing the card out of service in the late 1980s. Throughout most of the 1960s and 1970s, the Carte Blanche card was considered to be more prestigious than American Express or Diners Club, though its small cardmember base hindered its success. Carte Blanche also was the first to implement a 'Gold Card' program, but initially only as a means to recognize cardholders who were frequent users and paid their bills on time. In 2000, the Carte Blanche name was revived in the United States when Diners Club, which was also acquired by Citibank in 1981, introduced an upscale version of its card: the Diners Club Carte Blanche Card. It is an upper-level charge card on par with the American Express Platinum card. The card carries a US$300 annual fee and offers an extensive menu of perks geared toward spendthrifty travelers. It is accepted wherever regular Diners Club cards are accepted. Although Diners Club requires payment in full within 30 days, corporate accounts can pay within 60 days without penalty.